This is not a text book. This compelling case study in the form of a graphic novel vividly explores a year's therapy sessions as a search for understanding and truth. Told in a witty and thought-provoking manner, each engagingly illustrated scene is accompanied by deft commentary. Based on a case study of Pat (our sandal-wearing, cat-loving psychotherapist) and her new client, James (an ambitious barrister with a potentially harmful habit he can't stop), this graphic novel follows the anxieties, frustrations, mind-wanderings and break-throughs of each, through a year of therapy sessions together. Beautifully illustrated and accompanied by succinct and illuminating footnotes, this book offers a witty and thought-provoking exploration of the therapeutic journey, considering a range of skills, insights and techniques along the way. Whether a student, professional, or client, this is an accessible and entertaining read for anyone interested in psychotherapy. Ever wanted an insight into counselling? Or wished you could be a 'fly-on-the-wall' in a psychotherapy session? 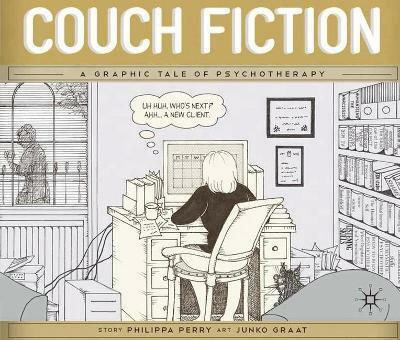 Couch Fiction allows you to peep through the key-hole of the therapy room door and, more than that, read the minds of the protagonists...Based on a case study of Pat (our sandal-wearing, cat-loving psychotherapist) and her new client, James (an ambitious barrister with a potentially harmful habit he can't stop), this graphic novel follows the anxieties, frustrations, mind-wanderings and break-throughs of each, through a year of therapy sessions together. Beautifully illustrated and accompanied by succinct and illuminating footnotes, this book offers a witty and thought-provoking exploration of the therapeutic journey, considering a range of skills, insights and techniques along the way. PHILIPPA PERRY (author) is a psychotherapist, psychotherapy supervisor and a fine art graduate living and practising in London. She is married to the artist Grayson Perry. JUNKO GRAAT (illustrator) trained and worked as a graphic designer in Japan and came to England to study European horticulture. As well as illustrating this tale of psychotherapy, Junko is a landscape designer/gardener and has also designed Japanese hieroglyphics for some of Grayson's work. Junko is married to the gardener and furniture maker, Chris Graat. ANDREW SAMUELS (afterword) is Professor of Analytical Psychology at Essex University and holds visiting chairs at New York, London and Roehampton universities. In addition to private practice as a Jungian Analyst, he works internationally with parties and leaders as a political consultant. Organisational and corporate clients include Tesco, Nokia, DelMonte, Ford, Everton FC, City of Tokyo, and the NHS. His most recent book was the award-winning Politics on the Couch.